Yasin Keskin of Vegisso Kitchen suffered a homophobic attack in Datça. Another person alleged to be a plain-clothes police officer participated in the attack. The police who responded to the attack then mocked Keskin rather than catching the attacker. On the night of Saturday, August 15th, Vegan LGBTI activist Yasin Keskin suffered a homophobic hate crime in the town of Datça in Muğla province. Keskin, who first encountered disconcerting looks while dancing at the bar he went to have fun, later took a punch from an unknown person as he left the bar. Following this, a person alleged to be a plain-clothes police officer attacked Keskin with a pipe. Keskin reminded us that while he was living in Istanbul, he had faced violence from the police because of his homosexuality, and that following the homophobic attacks he has suffered in the past he again encountered discrimination at the police station and in the justice system. “Both because they laughed at me and because of my previous experiences, I distanced myself from the police,” he said. The mashup photo of Taner Kurucan, a Soma resident who was allegedly slapped by PM Erdoğan during his visit, and Yasin Keskin, an LGBTI activist holding a banner “Even if we are gay,” went viral online. Bianet interviewed Yasin Keskin as the mainstream media articles and comments covertly legitimized the violence against him as he was gay. Yasin Keskin, the real owner of the photo taken at Gay Pride, filed a criminal complaint to the Antalya Prosecutor’s Office in order to determine the distributors of the photo and to prevent further publication of the images. The criminal complaint has been submitted to the İstanbul Prosecutor’s Office. “The comments under the released photo on social media include threats and hateful phrases. I’m 29 years old and have spent 29 years under the oppression and violence of society against homosexual people. I have been exposed to violence many times during my struggle and now I am scared of going to Istanbul, even of going out,” LGBTI activist Keskin told Bianet. “When I went to the courthouse, people said that they saw the photo. People that I don’t know have sent messages on social media. If anyone recognizes me while walking on the street, I could be exposed to a lynching attempt. We are living in a country in which homophobic and transgender murders occur frequently,” he added. Two days ago in my blog I wrote that the real catastrophe would involve what we would go through after the blast. I still think so. Yes, it is true that a massive catastrophe took place under that mine [Soma]. But what about the things that happened above the mine? Were those normal? Kicks, slaps, declarations such as “do not push your politics through the dead”, which were only followed by more politics. Let us accept the fact that what we have witnessed in the past four days have been as saddening as what happened inside the mine, in terms of social significance. How sad is it that we are split even during a moment of disaster! All of us are, to some extent, able to vocalize our thoughts and feelings in relation to this accident and the more than 300 hundred people who died. But what about the ugliness that ensued? Are we fully capable of expressing our thoughts on those? No. Even as you try to collect the sentences you are about to form, you experience strain in the creases of your brain. You are unable to form sentences. Because it is harder to talk about a humanity that is dead – or on the verge of dying – than it is to talk about dead bodies! You may find it easier to comprehend what I am saying when I explain below the last deeds of those who accused us of “involving politics in the matter” when we criticized the prime minister’s slap and his adviser’s kicks. That group’s most recent accomplishment was to declare that the citizen slapped by the prime minister is “GAY.” They came up with fake photos and spread this news online. One of the people involved in this disgusting scheme is not just a layperson. He is the CEO of ANAR, the main social research company that serves the AK Party, İbrahim Uslu. 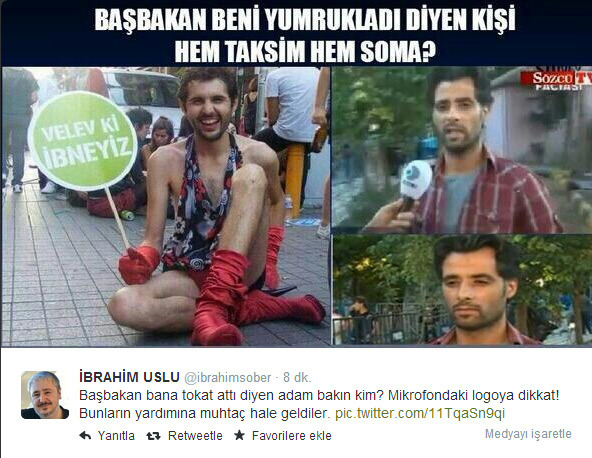 The infamous puppets of AK Party set out to denigrate the young man who was slapped by the prime minister. For this, they found an image on Google, made a sloppy modification to it and made him look like he was “gay.” The puppets engaged in this deceit in order to motivate supporters of the AK Party. The CEO of ANAR, İbrahim Uslu, offered his support by sharing the photo online. When Uslu saw the fake photo, he added a flashy caption that read, “See who the person is who claims that the prime minister slapped him? Pay attention to the logo on the microphone. They are now in a position to need these people’s help” and he shared the photo on Twitter. He thought he was pleasing the crowds as he did this. Perhaps he wanted to appear to be the man who provided a sneak peak backstage. Who knows? The banner on the left reads: “Even if we are gay,” a widespread slogan for Turkey’s LGBTI community.